All Payments to be made prior to pick up of trailer! Payments via Phone - Please call our office on 07 56188 118 / 0405 850 234 during office hours to process your credit card payment. 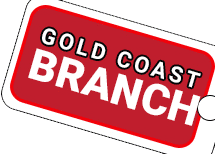 Cash Payment - All cash payments are to be made at our OFFICE located at 11 Precision Drive Molendinar, QLD 4214. If you chose 'phone me for credit card' we can process an order with Visa & Mastercard only. Credit Card processing over the phone is only available on weekdays between 8am to 4pm AEST. Note: There is a 1.5% Surchage on Credit Cards. Note: Please include your order number in the comments or reference area when depositing. If your banking institution does not include this facility please send an email to accounts stating your order number so we can process your order immediately. After purchasing a new 6 mtr boat in 2011 i got talked into purchasing another so called reputable brand of boat trailer from a QLD manufacture. After 12 mths it was showing signs of rust and deterioration like it was many years old and believe me i wash the boat and trailer down very well indeed after my return from a day spent on the water. I have since off loaded that piece of “so called” best brand available and purchased one of your Swiftco brand and what a positive contrast in comparison, from the way its built to the quality of fittings used , i can just see this trailer is going to last me a lifetime ! Just letting you know that we are extremely happy with the trailer, now that it is here and adjusted to suit our boat. Thanks again for your service. Trailer looks good and Chris was super helpful at the factory when I picked it up. Marcus trailer turned up today and I would like to commend you on the way the transaction was handled,very efficient and reliable. For one who hasn't yet fully embraced the cyber-space way of dealing,your company has taken me forward. I have received the trailer. It is great. I was totally amazed when I pulled up at the freight depot to pick it up... it is far better then the photos on your web page show!!! I can not believe how solid it is!!!! it will be a great reliable trailer and I will have no concerns traveling to the cape or to the gulf (a 5000-6000km round trip) with it. I have recommended you to a few people I know already who are considering a new trailer, as you cant beat the quality and the price. Over all but i am extremely happy with the trailer and have no concerns recommending you to others. I have taken delivery of it already and am very happy with it. my marine mechanic is too. cheers peter..
thanks Marcus for your reply good to see someone that is professional unlike so many I have sent enquiries do you. Keel roller arrived here about 8am today. I appreciate your prompt and efficient service, quite rare nowadays. Thank you also for trailer maintenance information. I would buy another Swiftco trailer. Thankyou Marcus for your help on Saturday with the Rollers. certainly be recommending you and your trailers to many others. Pleasant experience and easy transaction. I have the trailer home now. Thank you very much for the delivery of our Trailer. We are extremly happy with your service. All the best for 2017, we will highly recommend Swiftco Trailers to everyone. Dear Marcus, Andrew and Rex, a quick note to thank you all for your persistence and patience in supplying my new boat trailer. I appreciate all your efforts in trying to design a solution to meet the unique requirements of the Haines hull, but in the end the full roller trailer seems to work fine. The boat fits perfectly, the trailer is solid and it towed beautifully on the way home. I am yet to try to launch and retrieve the boat, but will let you know how I go. Once again I am pleased with the new trailer, it works well and looks great. Thank you all. Would you also be kind enough to pass on my thanks to your Provisioning Team in the workshop. They tried hard to get this right and the end result is obvious. Truly professional. Thanks Marcus. Purchasing a trailer from your factory has been a stress free experience. You accommodated my needs of a quick build which I am very appreciative of. Also taking the time to organize the painful task of the day permit for me to travel to nsw. I will recommend your business to anyone who I know that will be in need of a new trailer. Boating company here in Forster and he was quite impressed.So once again thanks. (certainly worth the drive to get it). A product/item/purchase deemed by Swiftco Trailers PL to be defective must be returned to Swiftco Trailers PL within 14 days of the invoice date for a replacement product or refunded A product/item/purchase incorrectly purchased by you, whereby a replacement product is requested by you, must be returned to Swiftco Trailers PL within 7 days of the invoice date for a replacement product. Non defective items will be applicable to a 10% restocking fee plus a 20% restocking fee. Swiftco Trailers PL will not refund the original shipping cost nor the handling fee incurred from the products return. If the purchase was made under a “FREE” shipping promotion, the replacement postage will not be applicable for the same free shipping cost. Swiftco Trailers PL maintains full discretion in decisions relating to a product fitness/ability for return. No refund will be applicable to any open or used product, including any product/packaging tampering in anyway. Each Swiftco trailer is applicable to a maximum towing capacity. It is your responsibility to ensure you tow under these conditions and weight as listed on the Compliance Plate on the trailer, including only towed by vehicle with correct braking requirements and towing capacity of make/model of towing vehicle. It is your responsibility to ensure your trailer is, and is maintained under the correct registration code and state. All items offered for sale on this site have been displayed with the pictures and text supplied by the manufacturer. Whilst every effort is made to verify this information, mistakes can occur for which Swiftco Trailers Pty Ltd cannot accept any liability. Hot dipped galvanized finish of each boat trailer surface is warranted against rust for one year from date of manufacture on the compliance plate. This also includes fabricated components manufactured by Swiftco Trailers PL. Cosmetic surface rust is not covered under warranty. General fitness warranty for a period of six months from date of manufacture on compliance plate applies to lighting, hydraulic breaking equipment, axle bearing (excluding water entry), seals, tyres (excluding normal wear and tear), springs, callipers, hubs, jockey wheels and surface finish of wheels. This warranty does not cover cosmetic appearance, white rust, natural oxidation of the galvanised surface, including cosmetic rust on painted powder coating or zinc coated surfaces, brake pads, brake cable, winch straps, bow, keel, wobble rollers, skids, rubber wheels, tyres, galvanising on moving components, such as springs, axles and other moving parts. Your Swiftco Trailer must be maintained in accordance with our Maintenance Manual including servicing every 12 months; brakes and bearings service attention every six months. Refer to maintenance manual for full details to ensure your warranty is not void. Warranty commences from the date of manufacture as listed on Compliance Plate. During the above stated warranty period, Swiftco Trailers PL will repair or replace defective parts with new or reconditioned parts without charge to you. This is only applicable if products have been used under specifications and maintained in accordance with Swiftco Trailers Maintenance Manual. All repairs/replacement parts under this warranty must be completed by an authorised Swiftco Trailers PL repair facility at the cost of transport worn by you. Swiftco Trailers PL reserve the right to make design changes in trailers built and/or sold at any time without incurring any obligation to make the same or similar changes to trailers previously built and/or sold by them. Swiftco Trailers PL will not cover any claim arising from negligence, accidental, economic or consequential loss or damage to the owner or to a third party, loss of income or failure to perform recommended maintenance service. The warranty, remedies and exclusions set forth below are exclusive and in lieu of all others, oral and written, expressed or implied. No reseller, agent or employee is authorised to make modifications, extensions or addition to this warranty. This warranty only covers normal use of the product and within guidelines of weight limitations or product use intended. All original parts replaced by Swiftco Trailers PL or its authorised service centre, become the property of Swiftco Trailers PL. Any costs associated with transfer, transport or recovery of and products or goods or trailer or product including delivery to authorised Swiftco Trailers PL repair facility will be the responsibility of you. Swiftco Trailers PL is not liable for loss, cost, expense, inconvenience or damage that my result from use or inability to use their product. Under no circumstances shall Swiftco trailers be liable for any loss, cost, expense, inconvenience or damage exceeding the purchase price of the product. Any trailer damage or third party damage/injury caused by or a result of incorrect boat setup, not tying down boat effectively, luggage/goods inside or on boat/trailers. Any consequential damage or repair work necessitated due to continued use or towing when damage has been noted by the user. Any trailers that are used within a hire business or lease arrangements. Any damages caused by external shipping/freight companies, including any delivery arranged by you. 11 Precision Drive, Molendinar, Queensland. 07 5618 8118 or for after hour enquiries 0419 665 720. We will direct you to the closest authorised Swiftco site. This document forms the Terms and Conditions and Warranty between the customer and Swiftco Trailers Pty Ltd, ABN 37 161 947 799 incorporating Swiftco Trailers and Swiftco Trailer Parts. Whereas the term ‘You’ and “Your” is used throughout this document, refers to any customer or potential customer of Swiftco Trailers and/or Swiftco Trailer parts. Whereas Swiftco Trailers PL is used throughout this document refers to either Swiftco Trailers or Swiftco Trailer Parts, unless otherwise clearly stated within this document. Customer, acknowledges that if they are entering into a purchase with Swiftco Trailers PL, the full amount on the Swiftco Trailers PL invoice is due and payable, including GST and customer agrees to the item product/items listed on the invoice. Until full payment is received the product/items remains under full ownership of Swiftco Trailers PL. A minimum 10% deposit is required on acceptance of all invoices. Once a deposit has been paid by customer, but customer wishes to cancel the customer forfeits 100% of the deposit amount if Swiftco Trailers PL have commenced production/shipped such product/item. If Swiftco Trailers have not commenced production you may be applicable to a 50% refund. If applicable, you agree to shipping/freight charges payable by you. These costs are variable depending on your location and delivery address. An estimate is provided and payable on your invoice however in the rare cases of freight being undercharged by Swiftco Trailers PL, you agree to pay to outstanding additional amount within five business days of the invoiced freight/shipping charges being emailed/mailed to you. If freight charges are less than on invoice, you may be eligible for credit. Swiftco Trailers PL is not liable for any loss, theft or damage to any goods or product in transit when shipping/freight has been organised by a third party. All quotes are valid for 5 days unless otherwise stated. All trailers are to be picked up within 10 working days of being complete. there will be a 50.00 per day storage fee after this time, unless organised prior. Any expenses incurred by Swiftco Trailers PL in the pursuit of reclaiming monies owed, including external fees such as, but not limited to, solicitors, debt collection agencies, QCAT, filing fee, bailiff fees shall be paid by the customer to Swiftco Trailers PL on top of the invoiced amount owing. Interest may also be added to the outstanding amount after 14 days of amount originally due by customer to Swiftco Trailers PL. Once goods or products are placed in hands of freight or courier company, the ownership of product is transferred to the customer. Swiftco Trailers PL are not liable for loss, damage or any liability whatsoever once the product or goods leave the premises. This includes any products purchased via finance or payment companies whereby full funds are still forthcoming. The only exception to transfer of ownership is if goods or products are not paid in full and not being purchased via finance or payment company. In this case ownership remains with Swiftco Trailers PL until full funds are receipted by Swiftco Trailers PL. Certain peak periods experienced by Swiftco Trailers PL may see wait time for production/manufacture of items/products up to 4 weeks. You will be notified if your product/item will be longer than this stated period. Refunds are only applicable under written consent by Director of Swiftco Trailers PL. Refunds will incur an administration fee of 10% and a restocking fee of 20%. If product/items has been used, products will be deemed as second hand and may not be eligible for a refund. Under acceptance of Director of Swiftco Trailers PL a refund may be approved with a cleaning fee of $90 per hour. Display models are sold in an “as is” condition and come with a 6mth total warranty or as provided in writing by director of Swiftco Trailers PL. Swiftco Trailers Pty Ltd accepts no liability if something goes wrong while using one of our products. We will honour our warranties and guarantees for our goods or products, but accept no responsibility for loss of/damage to business or personal/public/product/item injury. Any prizes donated or provided under sponsorship must be collected within 30 days, unless previously arranged in writing by Director of Swiftco Trailers PL. Any gift vouchers must be used by their expiry date. No refund provided on Gift Vouchers for voucher amount if full voucher amount not used. At times and if applying for finance you acknowledge that your details provided to us will be provided to our Finance Broker. Swiftco Trailers PL comply with The Privacy Act of 1998. Your details provided to Swiftco Trailers PL is retained for warranty purposes and may be given to a third party to service such warranty repairs. By providing Swiftco Trailers PL with your details you agree to Swiftco Trailers PL, and our associated businesses contacting you from time to time in relation to your purchase, feedback, and referral and agree to your comments being used in our testimonies both on our website and via social media campaigns. How to order a Boat Trailer from Swiftco Trailers Pty Ltd? Once you have chosen the boat trailer suited for your boat simply click 'Place order for Trailer' button which will take you to the Boat Trailer Order Page. Please select your Payment Options and fill in your Shipping Details to complete your order. Please note: You will only be paying a 30% deposit to secure your boat trailer order. What size boat trailer do I need? To find the correct trailer for your boat please use our Boat Trailer Finder. 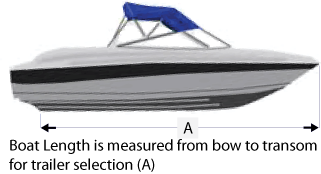 Boat length is measured from the bow to transom illustrated below (A). (excluding swimming platform). Measuring your boat for correct trailer selection. How much weight should be on my towball/drawbar? Typically on a boat/trailer the overall weight of the boat/motor trailer should not exceed between 5-7% of the total weight on the towball. Eg Boat/Motor/Trailer weights 800kg the towball weight should not exceed 56kg as a general rule. I am looking at buying a boat and am unsure whether it requires brakes or not? Can you help? Laws in Australia require boat/motor and trailer packages that weigh over 750kg including all three weights require brakes. If the boat/motor and trailer weighs over 2000kg you will need a breakaway system. See our Hydrastar Braking system page on our website for more information. l want to convert my trailer from skids to rollers can l do this? Yes we have rollers in a double roller set or quad roller set that clamp to most frames being 50mm or 75mm. See our parts section on our "Trailer Repair Centre" Website to view these rollers. Codes 3100 and 3110. How often should I service my trailer? We recommend your trailer to have a minor service within the first 6 months after purchase followed by a major brake & bearing service every 12 months. This will keep you safe on the road and increase the life of the trailer. Rollers and components reset and checked every 24 months. Is everything on the trailer Galvanized? YES. Everything that can be Galvanised is including axles, hubs, springs, u-bolts, nuts and washers are all galvanized. What stud pattern are Swiftco Boat Trailers Australia wheels? Can I convert my single axle trailer to tandem axle? What is the white powdery substance on my trailer? White Rust. The condition of the galvanised finish is governed by the environment in which the trailer is maintained and stored. Deterioration of the galvanizing (and the formation of 'white rust') is accelerated in areas of high humidity, poor ventilated storage, high salinity or poor water levels. See the following article for a detailed explanation. It is recommended that your trailer be serviced at least once a year, with brakes and bearings requiring six monthly service attention. Checks should be done on all your running gear including bearings, hubs, brakes, wheels and tyres. Wash your trailer down after each use and check that all bolts and nuts are tight. Regular maintenance will lengthen the life of the trailer and keep the trailer in safe operation. Every trailer has a compliance plate fitted Vehicle Identification Number (VIN) included in the price. Does the Boat Trailer come with Registration? No. The boat trailer needs to be registered in your name by you. We will supply you the receipt that has all the information on it to register the boat trailer including the VIN Number. Take the receipt along with the trailer to the transport department to register the boat Trailer. F3970 - Self Assessment of Single Axle Trailers form. Trailers with an Aggregate Trailer Mass (ATM) of 750 kgs or less do not have to be inspected and can be self-assessed by completing this form. How much does it cost to ship my trailer? Our freight charges include packaging, pallet, freight, insurance and gst. Click here to view shipping rates in your area. Do you require Boat to Trailer Fitting? Is there a warranty on your trailers? YES. Cilck here for full warranty information. LANOX-mx4 is a heavy duty anti-moisture, anti-corrosion lubricant made with a high grade lubricating oil and refined pure lanolin base with specialized chemical compounds. LANOX-mx4 contains no silicon, kerosene, acids or dieselene. LANOX-mx4 is harmless to metal points and surfaces, plastics, painted and enamel finishes, fibreglass, formica, rubber or neoprene seals. LANOX-mx4 doesn't become sticky, gooey or gum up. DOESN'T DRY OUT OR WASH OFF WITH WATER. LANOX-mx4 is non-conductive, non-static, non-corrosive and non-toxic. LANOX-mx4 prevents electrolysis between dissimilar metals. LANOX-mx4 is extremely resistant to salt water and drying out.